Call our expert staff today! Do you have a unique need not listed here? 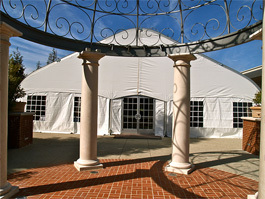 Exclusive Tent Rentals has been in business since 2004. From 2004 until today the company has worked extensively with the Department of Defense (Army, Navy, Marines and the National Guard) providing billeting tents, TOC tents, dining facilities, maintenance tents, aircraft hangars, aircraft containments, etc; for many training bases across the country including aircraft carriers, etc. The demanding temperature variations along with the wind and sand have been met with solutions from the company that have contributed to the company’s success. At Exclusive Tent Rentals we understand the demanding constraints and needs of the government. We are ready to react to any highly urgent request. Our inventory is palletized to meet time constraints; our personnel can be mobilized and able to perform on demand. Exclusive Tent Rentals has also worked within the Hospitality Industry, Convention Centers, Food Processing, Entertainment, Wedding Planners, Schools, Colleges, Universities, Religious Organizations, State fairs (Cal Expo), and Personal Parties. The company has proven that it has the ability to adapt and perform to any circumstance that arises. Exclusive Tent Rentals has done many customized tailoring where the impossible becomes possible. Our customers know that any job big or small we are able to perform immediately and efficiently. Exclusive Tent Rentals currently has the largest inventory of Pre-engineered Structures (clear span) and HVAC in California under one roof. We carry a huge inventory of power distribution equipment that includes: Generators, Cables, Power Distribution, Power Centers, Stringers, Transformers and Adapters; lighting and maintaining the atmospheric temperature of any size tent is no obstacle for us. We also have flooring, tables, chairs, and linens for any type of event. With over 200 years of combined experience, we have the knowledge to perform for any type of event and will continue to keep building successful relationships across the country.